The book was delivery in second day but I expected to get it on the very next day. But good packaging and nice book. Its just 35/-. Amazing book at such low price. One can read it whenever they find time. Very handy to carry in a bag. Good book. Nice thoughts by great people. One can get inspired by reading such high thoughts of great people. the collection was very unique. 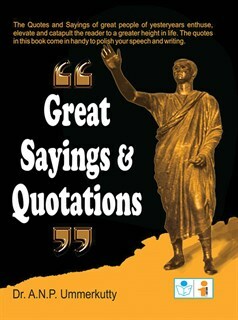 It covered sayings by many personalities. Got it the very next day. Few pages were folded but the condition of the book was good. People who are writing essays will find this book very useful. Good book for students. They can use in their essay writings.